Pleading the Sixth: A U.S. District Court found in early December that two Washington cities are responsible for the systemic deficiencies depriving the indigent accused of their constitutional right to meaningful representation. In granting injunctive relief, the Court determined the steps needed to be taken to ensure that the criminal justice system be appropriately adversarial. The 6AC explores the Wilbur v. Mount Vernon decision through the prism of the ABA Ten Principles and its potential impact on the nation’s indigent defense crisis. Announcing that “adversarial testing of the government’s case” was so infrequent as to be a “non-factor in the functioning of the Cities’ criminal justice system,” the judge of the U.S. District Court for the Western District of Washington (Seattle) found the appointment of counsel in Mount Vernon and Burlington to be “little more than a formality,” resulting in plea bargains having almost nothing to do with the individualized nature of each case. Importantly, the court found the cities culpable because this lack of adversarial testing of the prosecution’s cases was “natural, foreseeable, and expected,” given the deficient structure of indigent defense services. It therefore follows that there must be a “foreseeable” way for policymakers to ensure that their criminal justice systems (whether organized at the state, county or municipal level) are appropriately “adversarial” to avoid being found culpable for constructing constitutionally deficient right to counsel delivery models. 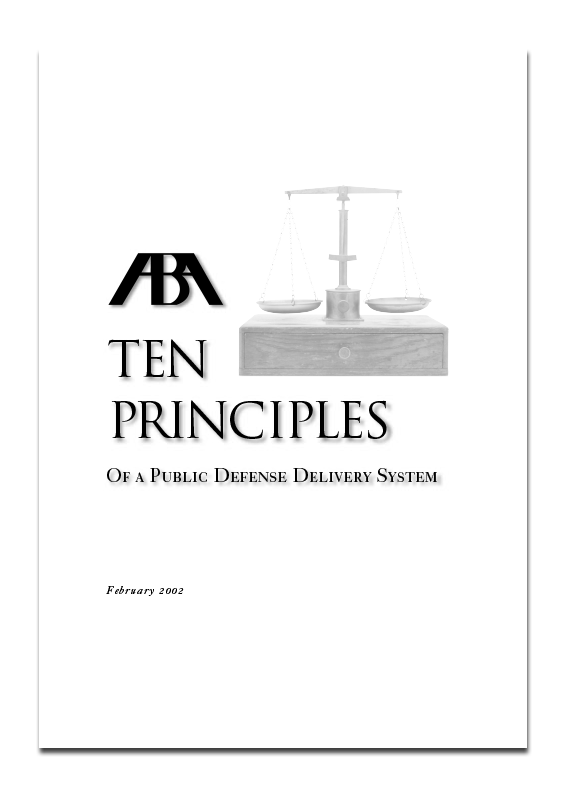 Though not explicitly citing by name the American Bar Association (ABA) Ten Principles of a Public Defense Delivery System, it is clear that both the criteria used by Judge Lasnik to determine that the cities violated defendants’ constitutional rights and the parameters he established to remedy the systemic indigent defense deficiencies are entirely consistent with the ABA Ten Principles. As such, the Principles are to this Federal Court the threshold test for whether defender services are adversarial, and thus constitutional, as detailed below. What are the indicators of a non-adversarial, deficient system? The most prevalent manner for delivering indigent defense services in the United States is the flat fee contract method, where a private attorney handles an unlimited number of cases for a single flat fee under contract to a county administrator or the judge presiding over the lawyer’s cases. These systems lack accountability and proper supervision. The quality delivered differs significantly from one courtroom to the next. They are not truly “systems” – without any clear structure, they would be better described as “non-systems.” At the time that the American Civil Liberties Union filed their lawsuit, both Mount Vernon and Burlington employed just such a model. The prohibition of flat fee contracts in Principle 8 is also in place because lawyers in these types of “non-systems” often take into account what they must do to please a judge or county administrator in order to get the next contract rather than solely advocating on a defendant’s behalf. When lawyers triage the duty they owe each and every client, it is not uncommon for such attorneys to end up juggling several hundred cases at the same time. 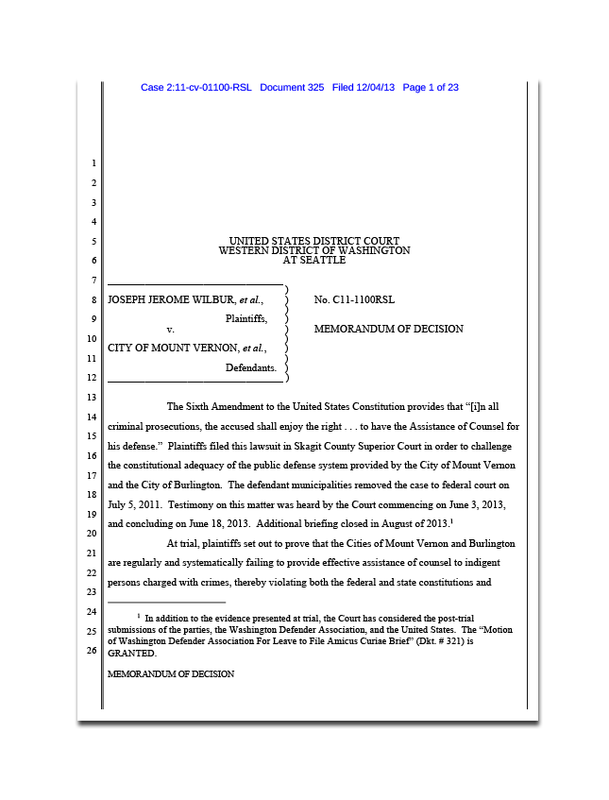 Not surprisingly, Judge Lasnik cites the “sheer number of cases” Burlington and Mount Vernon attorneys were contracted to handle (far in excess of national standards that ABA Principle 5 notes should “in no event be exceeded”) as the compelling reason that the Washington cities’ contract defenders met clients for the first time in court “never having had the opportunity to meet with their attorneys in a confidential setting” (in violation of Principle 3). Perhaps the greatest criticism of the public defender services was the entire lack of supervision (in violation of Principle 10). As Lasnik decries, “[t]he City officials who administered the public defense contracts did not feel it was necessary for them to know how many non-public defense cases [the defenders] were handling, the number of public defense cases they were assigned, or even whether the defenders were complying with the standards for defense counsel set forth in the Cities’ own ordinances and contracts.” Actually, the Sixth Amendment Center (6AC) often hears this argument in our fieldwork – i.e., since attorneys are bound by their professional ethics, they must therefore be providing adequate representation without any data to back that up. Interestingly, the cities went beyond the argument that indigent defense supervision is simply unnecessary. They argued that exerting supervision into the attorney/client relationship was a violation of the constitutional rights of the defendant. Well, yes and no. As Principle 1 informs us, having a judge or a county/city administrator or some other policymaker, for example, looking in case files or interviewing defendants is a violation of the sacrosanct attorney-client relationship. But it does not follow logically therefore that any and all forms of supervision of an indigent defense system breaches that same confidentiality. Indeed, the proper way to ensure that attorneys are providing constitutionally adequate representation is to have a qualified lawyer ethically bound to protect confidentiality doing the attorneys’ performance reviews. Proper evaluations generally start with the establishment of performance standards, training against such standards so that attorneys know what is expected of them, monitoring caseloads to ensure attorneys have the time to meet said standards, and then assessing attorney performance against those standards. To be clear, performance standards are not a checklist that has to be accomplished in every single case (as is forbidden under Strickland v. Washington). As Judge Lasnik astutely notes, “no hard and fast number of pretrial motions or trials is expected,” but when hardly any motions are ever filed and the number of trials is “incredibly small” it is a “sign of a deeper systemic problem.” So, unless a system has a supervisory component that is independent of undue political and judicial interference it cannot guarantee that services are meeting constitutional muster. And the Wilbur decision offers the most compelling reason why adversarial systems must have institutional, independent systems of evaluation. Judge Lasnik notes that, “[l]egislative and monitoring decisions made by the policymaking authorities of the Cities ensured that any defects in the public defense system would go undetected or could be easily ignored.” That is, so long as no qualified defense attorney is monitoring the system, it is too easy for judges, prosecutors and defense providers to become inured to the ordinary injustices happening every right in front of them every single day. Are the Wilbur remedies a blueprint for overcoming our national indigent defense crisis? Not surprisingly, Judge Lasnik starts his remedy by establishing independent oversight of indigent services by requiring the cities to hire a qualified half-time attorney to provide supervision. As readers of this blog recognize, “independence” is the first Principle because without it achieving any of the other Principles is not possible. The attorney must have a minimum of five-years experience, including jury trials, with no previous ties to the cities, their attorneys, or any of their witnesses in Wilbur. So from the outset, the Court has set the remedy to be inclusive of Principles 1 (independence), 6 (attorney qualifications) and 10 (supervision). The new public defense supervisor must determine whether the public defenders are qualified and trained to be handling the complexity of the cases they are assigned (continuing the argument for attorney qualification at the heart of Principle 6). Next, the independent supervisor must ensure that public defenders are “making contact” (in-person or by phone) in a confidential setting with each new client within 72 hours of appointment, underscoring the need for Principles 3 (early appointment) and Principle 4 (confidential meetings). Judge Lasnik also cites the Washington Defender Association’s performance standards, indicating that attorneys will be assessed, at the very least, against key aspects of performance, like: client contact; a healthy motions practice; use of outside investigators; and, advising clients of collateral consequences – like loss of housing or deportation – of guilty pleas. And how does the Court propose to assess whether attorneys are doing these things on a regular and consistent basis? The answer: time-tracking. The Wilbur decision requires public defense attorneys to maintain “contemporaneous records on a daily basis showing the amount of time spent on each task for each case, recorded in tenth-of-an-hour increments.” The “tasks” in this case are those enumerated in performance standards. The 6AC believes that all public defense services (staff public defenders, assigned counsel and contract defenders alike) should track attorney and non-attorney time against specific performance criteria to garner a more accurate projection of what it actually takes to handle each component of a client’s advocacy needs, based on each type of case. This is a far more accurate method of measuring (and thereby limiting) workload than any other available. More than that, however, tracking time enables policymakers to tie spe­cific variables (like, “time meeting with the client in person”) not only to specific case outcomes and dispositions, but also to systemic outcomes (like recidivism rates, or the rate of former clients now employed and contributing to the tax base). This is the first such instance of the DOJ weighing in on indigent defense litigation, but in all likelihood it will not be their last. Given the expressed intent that the “United States has an interest in ensuring that all jurisdictions—federal, state, and local—are fulfilling their obligation under the Constitution to provide effective assistance of counsel to individuals facing criminal charges who cannot afford an attorney, as required by Gideon v. Wainwright, 372 U.S. 335 (1963),” and given the massive scope of the national indigent defense crisis, the 6AC encourages further DOJ involvement. There are 3,033 organized county or county-equivalent governments in the United States. The Department of Justice, Bureau of Justice Statistics reports that there are only 957 public defender offices in the country. Even accounting for the few contract systems that do meet national standards, it is simply a fact that a full 64% of the country (over 1,900 counties) operates “non-systems” when it comes to the constitutional right to counsel, similar to those now being remedied in Burlington and Mount Vernon. What the court recognized in Wilbur is the simple notion that the Sixth Amendment to the Constitution means more than assigning to the defendant a warm body with a bar card. An attorney must have sufficient time to meet with the client, explore the facts of the case, conduct independent investigation, and research collateral consequences, among other tasks. Creating systems, consistent with the ABA Ten Principles, is the blueprint for reform.